The following weekend would be Helldorado Days. Tombstone has several special weekends each year such as Wyatt Earp days, Nellie Cashman days and a few others but Helldorado days is the granddaddy of them all. It’s a three day celebration with a Chile cook off, a contest to see who can make the tastiest dish, a full three days of gunfight shows, mock hangings and a featured country western singer to finish up the weekend during an event called the Concert under the Stars. More than anything else it is just one huge party which people from Tucson and many other towns come to each year. Tombstone closes the streets off to traffic during this event and a large crowd of people wonder back and forth between the bars and drink to excess. Friday morning would start the beginning of a long weekend for the Vigilante's. We would do three shows per day, all three days. This would be my first Helldorado experience, so I decided to walk over to Jack’s place and ask him to fill me in on how the weekend would go. As we were drinking coffee and watching the sunrise he began to clue me in. He explained how busy everyone would be for those three days with doing the gunfight shows, helping to set up the Chile cook off, setting up the stage for the Concert under the Stars, and holding the raffle of a .30-30 lever action Winchester rifle. He said that by the end of this weekend, I would truly be glad that it was over with and we would all be worn out. Normally the gunfight shows held on Allen Street but during Helldorado weekend they were held down on an old western set next to the Lions Club off of Fourth and Toughnut streets behind the library. 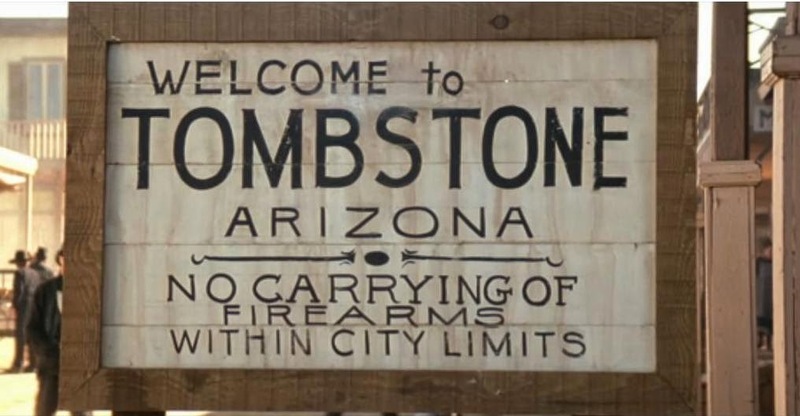 The city of Tombstone issued permits allowing everyone involved with the shows to carry a firearm within the city limits for a short period of time before and after each show and each mock hanging also required these permits. In other words, you had to have a city permit to carry a gun at anytime in Tombstone even though the state law reads differently. Jack and I decided to go uptown and have breakfast at the Longhorn restaurant. We both dressed up in our costumes, and looking like the Earp brothers of a hundred years ago we drove to town and entered the establishment. While eating our breakfast Jack told me to enjoy it because this would probably be the only chance we would have to eat all day. He also said that I should watch myself because, knowing the marshal’s department as he did, he believed that they would be watching me and would take advantage of any situation they could to let me know who was boss and also let the public know that they would enforce the old Earp ordinance. I just laughed it off, but I would soon find out that Jack’s advice was right on the money. As usual, we all met at the Vigilante Hall on West Allen Street before the show began. We would practice our parts for each skit to be preformed and go over the full day’s events. The first two days went very well with no trouble. But on the third and final day, Sunday, I had my second run in with the marshal and one of his deputies. As we wrapped up the last show of the weekend we than began building the portable cover on the set for the Concert under the Stars which stared Janie Fricke. We also helped the professional stage people set up the lights and sound system by being nothing more than their gophers. Once this was finished, the chief of the Vigilantes asked me if I would walk up to Big Nose Kate’s Saloon and retrieve the rifle to be raffled. The raffled Winchester rifle had been on display at Kate’s for the purpose of selling tickets. Jack offered to walk uptown with me, and as we passed through the gate of the outdoor auditorium which enclosed the set, I could see the Marshal and his deputy in the library parking lot leaning against their squad car while making it very apparent that they were keeping an eye on me, while also watching the crowd. The marshal stepped out in front of me and asked why we were wearing our handguns. I told him that we were only going up to Kate’s to retrieve the rifle and that we were under permit by the city anyway. He snickered, and with a look of disdain on his face he told me that the permit on this day was only good for the library parking lot and the set down below; and if I didn't want my weapon confiscated, I should place it into someone else’s custody while going uptown. I almost told him to go ahead and take it, knowing that legally I would have him, along with the city, right where I wanted them, but instead I asked Jack to hold my weapon because the raffle was about to take place and I didn't have the time to argue with them. I returned from Kate’s with the rifle in hand and as I passed by the marshal and his deputy, I could see them both smiling like cats who had just ate the canary. The deputy then made the snide remark about how they could arrest me for carrying the rifle if they chose to do so. I looked at him with a blank stare and shook my head at their arrogance while continuing along my way. After the raffle was finished we had about four hours or so before a few of us, including myself and Jack would have to work security for the Janie Fricke show, so we headed home to get some rest. Later, Jack and I decided to go uptown and have a beer so we locked our guns in Jack’s truck in the library parking lot and walked the short distance into town. When we got there the bars were so crowded you could hardly get through the doors with wall to wall people hooting, hollering and carrying on, but somehow we got into Kate’s and order a beer. We found a little corner of floor space and stood there the whole time yelling at the top of our lungs just so we could hear each other over the crowd noise and loud music. I had enough of that situation, finished my beer and walked outside where there was still some semblance of sanity. I sat down on the bench outside, but even there it was still very noisy, but at least I could breath. It was then that Bill and Hal, along with other members of the Vigilantes, walked up to me asking questions about my encounter with the marshal in the parking lot, wanting to know what had taken place. After I told them the chief of the Vigilantes stated that as Vigilantes we must obey the law. I replied that the Vigilantes were not obeying the law by allowing an illegal ordinance to be shoved down their throats and looking the other way while the city of Tombstone broke the law. He said that it wasn't up to the Vigilantes to correct the problem and walked away with several of the group following him like sheep. Bill and Hal were the only two to stay behind, and both joined me on the bench. They agreed with me that most members of the Vigilantes felt the same way I did but just like most of the people in town they didn't have the intestinal fortitude to stand up to Tombstone and its good old boy system. Throughout the rest of the evening, I couldn't shake off of the thoughts about the old ordinance, the city of Tombstone, and the inaction of the Vigilante members. Maybe I shouldn't have felt the way I did but I just couldn't help but think how gutless the people of Tombstone and the Vigilantes were, that they wouldn't even stand up for their own rights. Even though I had heard complaints about the old Earp ordinance from several of these people, they feared retaliation from the city and were just too scared, and hadn't enough sand to do anything about it. The concert had finished about midnight or so, and I was bone tired. As Jack and I were driving home he laughed slightly and told me to look in the side mirror of the truck. Sure enough, one of the deputies from Tombstone had followed us to the city limits. I laughed and told Jack that I was too tired to care and as far as I was concerned they could all go to hell! The following morning I fed the horses and while walking back to the house I saw John waving to me from his back door, so I walked over and joined him and Jack for a cup of coffee. I could tell that the two of them had been discussing my situation and that Jack had already explained to John what had happened the previous day. When I sat down, John, in a kidding manner, asked, "Well, how do you like the Tombstone Keystone Cops now"? I laughed, and told him that I did not want to get into this story all over again if he didn't mind. He said that he understood and that Jack had told him the whole thing anyway. He said that something had to be done about Tombstone and the old Earp ordinance but he would not be able to help because he was going to be moving in a short period of time. Surprised, I asked him when he had made that decision. "This morning", he replied. He had an offer to move up to Oatman Arizona where he could work an old mine in his spare time and that fit John to a tee. Jack spoke up saying that he didn't believe that the old ordinance should be challenged because of Tombstone’s violent history. He felt that someone might decide to play Wyatt Earp or Doc Holliday with loaded guns. I just looked at Jack, shook my head, and told him that was ridiculous. An honest man with a gun is no one to fear and the blood running in the streets theory is nothing more than hysterical hype. All one needed to do was look at places like California or Washington, D.C. where they have the strictest gun laws in this country, yet have more blood running in the streets than anywhere else. A criminal is a criminal and he will carry a gun no matter what the laws read. The only thing gun laws accomplish is to take away the honest citizen’s rights to self defense! I wanted to go uptown and pick up my mail so I excused myself and drove to the Post Office. Afterwards, I walked down to the Legends bar to have a cup of coffee because I knew that Jack would show up to finish his morning fix. It was only about twenty minutes later when Jack walked in, and behind him was a fellow by the name of Ed. Ed was a real nice guy who had retired from the police force somewhere in Texas. He worked at the Bird Cage Theater, greeting people as they came in. He was dressed in the full costume of a gentleman gambler from the 1880s and looked very sharp. Jack set down on one side of me and Ed set on the other. Jack said to Ed, "Tell Terry what happened to you". Ed told me that he knew about my problems with the marshal’s office and said that he also was having a problem with them. He said that a few days prior the marshal had stopped in front of the Bird Cage Theater and waved him over to his car. He then told Ed that he could no longer wear his gun as part of his costume. Ed explained to him that it was always unloaded and it was only an ornament, but the marshal would have none of it and made Ed put his gun in his truck. Ed said that the following morning he bought a cap pistol and began wearing it in his holster. Again the marshal pulled up in front of the Bird Cage and waved him over. Ed then explained to the marshal that he was wearing a cap pistol and showed it to him. At that point the marshal told Ed that he could not even wear a cap pistol because it resembled a real gun. I could not believe what I was hearing! Any twelve year old kid could walk down the streets of Tombstone with a cap gun but a responsible adult couldn't? This was absolutely absurd! It was at that very moment that I decided to fight the arrogant city officials who were denying the citizens of Tombstone their legal rights as set forth by the constitution of the state of Arizona. Ed excused himself, needing to return to work, and I told him that I had decided to fight the Tombstone ordinance. I asked him to get a hold of me in a few days should he decide he wanted to join me in this fight. He said that he would let me know and walked out the door. I then looked at Jack and asked if he would join in the fight, to which he replied, he didn't believe so. I told him that there were no hard feelings and that his decision would have no bearing on our friendship. He said thanks, and stated that he had to go to Sierra Vista to pick up some hay. While finishing my last cup of coffee, I could hear two of the local wanna-be cowboy’s telling a few tourists about what it was like to live the cowboy lifestyle. They were all dressed up in their 1800s garb and lying through their teeth as to get free drinks from the unsuspecting tourist couple who didn't know any better. Those two so called "cowboys" wouldn't have known the difference between a bull and a steer, but that’s the way some of the local drunks played the game in Tombstone. As I stood up to leave, I turned and stared at the two, and both of them got real quiet until I walked away. When I got home I decided to write my next poem because of the drugstore Cowboy type. I call it, “A Cowboys life”. Some people think a cowboy’s life is full of glamour, adventure and desire. But they never feel the broken bones or the loneliness of freezing by a fire. But that’s because it’s all they know and they learned it from TV. People if you’ll listen close these things I’ll explain to you now. It sometimes gets to you a little but you just keep working away. Day, ride back to the ranch to take care of your horse, this is the real cowboy Way. next time you think that it’s full of adventure you’re probably just watching TV. Later that afternoon, I helped Jack unload his hay and stack it in the barn. Afterwards we walked over to my place for a cold drink of ice tea and took a seat on my porch. Jack asked me if I was serious about taking Tombstone to task over their old ordinance, adding that if I did so I would have to be ready for most anything that the city officials and the marshal’s office would throw at me in the way of harassment or even trumped up charges and traffic citations. I told Jack, "No matter what Tombstone may have in store for me I will fight them with every fiber of my being. They are the one’s who are breaking the law, and through intimidation they were controlling their citizenry with an iron fist, had done so for far too many years and gotten away with it. It was time that Tombstone learned that it was not an all powerful entity unto itself and we were no longer living in the eighteen hundreds". Jack said that there was a city council meeting on the coming Friday, and maybe I should first go there to plead my case and see if I could gain support from some of the local citizens. Thinking that this would be a reasonable place to start, I decided to do that. I had no clue of what I was up against, or the troubles which were to come. -- end of Chapter Three.